The choice of your bitcoin mining hardware is extremely important. Not only do you have to take into consideration how big the revenue can be when you’re acquiring it, but you also have to try to figure out how quickly it could become obsolete. There really is no point in mining if you have to get a new rig before the old one pays for itself. Therefore, you need high-quality equipment if you’re going to pursue this activity, especially if you’re planning on making a serious profit from it. We are here to help you make the right choice, which is why we’ve prepared this Antminer S9 review. In it, you will learn everything you need to know about the one most advanced and most popular miners in the world at the moment. Let’s get started! If you’re completely new to this, you’ll appreciate a bit of background on this product. Antminer S9 is an ASIC miner produced by a company called Bitmain. It is the successor of Antminer S7, which was largely regarded by miners to be the best rig on the market of its time. The newest version lives up to that name and even surpasses it, but we will talk about that a bit later in the article. Antminer S9 was first released in 2016, and the community immediately picked up on its awesome stats. So much so that you still have to pre-order it from Bitmain today because the demand for this rig is still incredibly high. It immediately became a benchmark for all other machines of this kind to follow in terms of efficiency and sheer processing power. It is the first ASIC mining rig to be based on a 16nm process node, which was in and of itself a huge breakthrough. But this is just one of many impressive features we need to examine in this Antminer S9 review. Keep reading to learn much more. OK, let’s start the analysis of this machine’s specs by taking a look at everything concerning Antminer S9 power consumption. Now, given that these rigs are produced in batches, certain numbers will depend on the batch you get your miner from, and Antminer S9 power consumption is indeed one of those numbers. It can range from 1127W to 1372W, give or take 10%. There is also one special requirement here when we’re talking about electricity. You see, this mining rig cannot just be plugged into your average wall socket. You will need a special power supply unit for it, which will incur additional costs on top of the rig’s price if you don’t have it by your side. The manufacturer recommends using their APW3 for that purpose, but you can also use an EVGA SuperNOVA PSU if you have it. If you don’t, Bitmain’s solution seems better because it costs less than the alternative (more than 100 dollars less, actually). Finally, let’s talk a bit about Antminer S9 power efficiency, which is where this rig truly shines. You see, it will spend less than 0.1 J per GH (0.098, to be exact), which makes it one of the most efficient, if not the most efficient bitcoin mining rigs you can get. That’s a remarkably low number, but there are more very impressive features we have to go through. 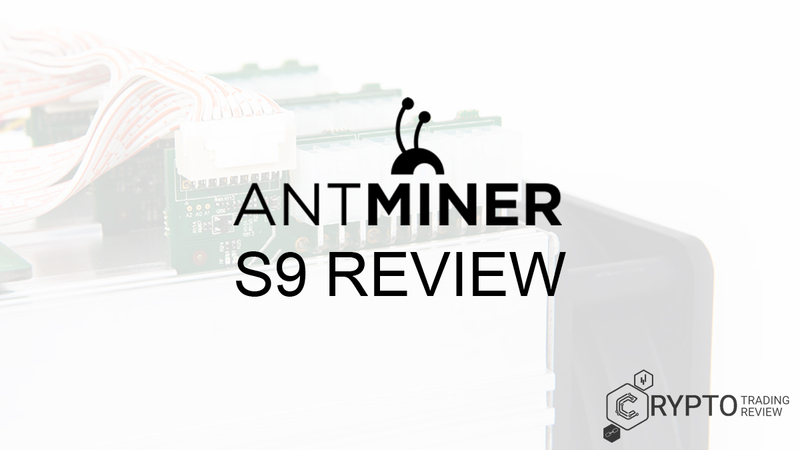 Our Antminer S9 review continues below. Another number that depends on the batch you order your machine from is Antminer S9 hashrate. It goes from 11.5 TH/s all the way to 14 TH/s, which is absolutely incredible. Actual performance may vary about five percent, but even with that what you have here is the most powerful mining rig in the world. Other possible hashrates you can get out of your Antminer S9 are 12 TH/s, 12.5 TH/s, 13 TH/s and 13.5 TH/s. Exactly 189 of Bitmain’s BM1387 chips make these numbers possible, with a Dual ARM Cortex-A9 microprocessor making sure everything runs smoothly. And just to show you how powerful this is, we will point something out. The whole Bitcoin network could not reach this hashrate before 2012! Since we’re on the subject, allow us to mention a few more Antminer S9 specs. Keep in mind that its operating temperature is from 0 to 40 degrees Celsius (from 32 to 104 degrees Fahrenheit), plus it has an ethernet network connection. Furthermore, we have to say that the user interface is pretty intuitive – just input your wallet address and the settings of your mining pool to complete the setup. After specs like this, you’re probably wondering where you can buy Antminer S9. Just hold on and sit tight: we will show you that next. How to buy Antminer S9? So, how can you buy Antminer S9? Well, it’s not exactly a walk to the hardware store – you’ll have to do it online, and there are several sources you can order it from. First and foremost, you can buy Antminer S9 from the website of the company that produces it (Bitmain). However, like we said earlier, these mining rigs are sold in batches which tend to be sold our fairly quickly. We therefore suggest following the company closely for information about the next batch, and social networks can help you out there a lot. And if you can pre-order it, even better! If Bitmain is out of stock, don’t worry – you can also buy Antminer S9 on Amazon. Expect a higher price, though, just like in the case of Ledger Nano S. The good thing is that you can buy other products for this mining rig (power supply units, noise cancellation boxes etc) there which are not necessarily produced by the same company. The same goes for buying on eBay. But what is the Antminer S9 price? Well, that depends on where you’re buying it. Like we said, you can expect a higher price on sites like Amazon and eBay. If you buy from Bitmain directly, it will set you back exactly 2400$, whereas on Amazon the price is slightly above 4000$. On eBay, you can get your Antminer S9 slightly cheaper than on Amazon, but this all depends on the situation on these websites, of course. Remember, this is without a power supply unit. Without any doubt, the price is not low, so the question of Antminer S9 profitability arises. We will analyse that in the next part of our review. Stay tuned! Can you count on Antminer S9 profitability? Is Antminer S9 profitable? That’s the main question after all of this. Is it worth it to investing in this bitcoin mining rig now? The price certainly is high, but you have to remember that the specs are something no other mining rig can offer. So, let’s crunch the numbers. As you know, the profitability of bitcoin mining is affected by many factors you can’t really influence. By this, we primarily mean the cryptocurrency’s price and the price of electricity you need to power the rig. To avoid complications, you can easily find out everything you want to know by using an Antminer S9 profitability calculator, like the one on NiceHash.com, for example. Simply input the price of electricity in your area and see what you can expect. However, we can tell you right away that the chance of reaching profit with Antminer S9 is high. At the moment we’re writing this article, Bitcoin price is slightly below 11400$, and we took electricity prices from Germany and the US as an example. Given that you can mine approximately 0.00136 BTC per day with this rig, in Germany you can expect to earn about 140$ a month. In the US, on the other hand, this goes up to over 250$. The United Kingdom is also closely behind the United States. Therefore, you can earn from this, but the main thing Antminer S9 profitability depends on is the price you pay for device itself. If you get it from Bitmain, you can expect the device to pay for itself in about 9 months. However, do remember that the price of Bitcoin can go up, which can shorten this period. But don’t forget to treat the device with care because you don’t want any failures now, do you? We have some tips on that in the next part of our Antminer S9 review. Ok, so you’ve decided you want to become a serious miner and have acquired this device. Where and how to set it up? We already said that you will need a separate power supply unit for it, so we won’t go back to that much, just remember to take this fact into consideration. The main source of cooling are two powerful fans installed on the rig. A lot of power means a lot of cooling is needed, which is why Antminer S9 noise may present a problem. The fans can produce up to about 75dB, which is why you probably don’t want to have the whole setup in your house. Stashing the equipment in your garage or basement is recommended. If you do that, however, some things have to be taken into account. Places like that can have problems with moisture, so make sure you protect your machine from it. Additionally, dust can be a problem too because of the heat the rig is producing. Some people solve this by installing dust filters, but be careful that they don’t cut the flow of air too much because you will then be facing overheating problems. Heat is not necessarily a bad thing because something as powerful as this can produce enough of it to be used for other purposes, just be sure you manage everything carefully. There are many interesting solutions miners have come up with, so browse the internet a bit and see what you can find there. Be aware, though, that the people doing things like that are doing so at their own risk. That’s not to say all such solutions are bad, just that you need to exercise caution. Additionally, in some cases, that may mean sinking in more funds in the whole thing, which reduces overall profit you get from your miner. The bottom line is – be careful when experimenting. We are finally at the end of our Antminer S9 review, so we will give you a short recap of everything we have learned about this impressive machine. First and foremost, we must say that it absolutely lives up to the reputation of its predecessor, as it is one of the most powerful, if not the most powerful mining rig on the market. Antminer S9 hashrate goes up to 14 TH/s, which is a simply staggering amount. Keep in mind, though, that it doesn’t come with its own power supply unit, but if you already have one such unit, you may be good to go because the rig is compatible with a couple of models. When it comes to the financial side of things, the price is high, but you can still expect to get your money back because of incredible Antminer S9 specs. This is an extremely efficient rig, so every watt of your electricity will be very well spent. Because of all this, getting your hands on this piece of technology can be tough – the demand is quite high, despite the price. The company producing it releases it in batches which are regularly sold out in a matter of days. You can therefore try to buy Antminer S9 on Amazon or eBay, but expect a higher price there. All in all, if you want to become a bitcoin miner, this is the rig to use. Although the initial investment is significant, we believe it’s well worth it because you will get a great tool and be able to mine for a long time. And if you need more tips on the world of cryptocurrencies, don’t be afraid to look around our website. We have plenty of articles just like this one!